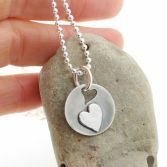 Sterling Silver Double Love Heart Pendant has been made using traditional silversmithing tecniques. 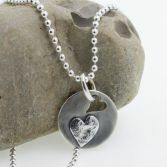 The pendant element has been made 1mm thick silver sheet as has the cut out Heart soldered on top. 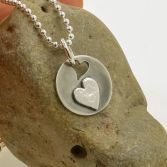 The Heart pendant measures 18mm across and 24mm long incuding the bail loop. 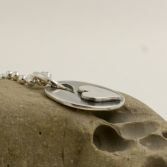 The disc has a polished surface and the soldered on heart has a fine dimpled surface which catches the light beautifully. 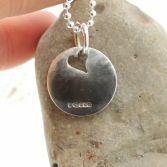 The pendant is hung on a pretty 2mm sterling silver ball chain which is 16 inches long. 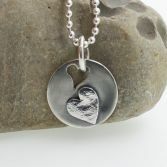 The Double Heart pendant has full UK hallmarks stamped at a UK Assay Office. The Double Love Heart Pendant will be presented to you in one of my signature gift boxes and posted via Royal Mail signed for delivery (free of charge) to any UK address.